Just found a pair of MB-80s in my girlfriend's basement. Her ex used to work for Bozak in the 80's when they were in New Britain. These things sound amazing!! I can't believe how bright and alive the music sounds. I have them hooked up to a Soundcraftsmen amp and pre-amp and am blown away every time I hear them. I could only find one article by the man who designed the MB-80 for Bozak. Anyone have any info or specs? There really nice and compact but weigh about twenty pounds and use a solid oak cabinet. Here's a bio of Peter Lederman of SoundSmith, who worked at Bozak and engineered the MB80. Says "I engineered and re-engineered many products at Bozak, but by far, my favorite was a miniature speaker system called the MB80"
I have some literature about the MB-80 and also the expanded system that used the sub-woofer. Have you contacted Peter Ledermann at Soundsmith? He knows more about them than anyone I know. When I visited him a few years back he had an awesome set in his office. If you would like to get the particulars from the literature or scans, let me know. This thread piqued my interest in the Bozak MB-80 four years ago. After watching 4 years, finally scored a pair. They arrived today. Very impressive looking: Small boxes (12-1/2" x 7-7/8" x 7-1/8"), very HEAVY for their size (16 pounds each), very nice real oak veneer. Hooked them up and of course they don't sound anything like my AR3a's but on material with no deep bass they sound really nice. Played "Passion Grace & Fire"--a trio of acoustic guitars. Nice. They also sound great with jazz and vocals, such as Diana Krall. I engineered and re-engineered many products at Bozak, but by far, my favorite was a miniature speaker system called the MB80. I had taken the Bozak six-inch aluminum cone mid range driver Rudy engineered and converted it to an ultra wide bandwidth performer. To this I matched an unusually wide bandwidth tweeter and in keeping with the philosophy I had been taught by Rudy, crafted a modified first - order crossover in the effort to produce an amplitude and phase coherent dynamic loudspeaker. . . . I received many complementary letters on the design of the MB80's over the years. One of my great joys occurred when I first demonstrated these miniatures at a CES show. I had positioned them on some unique adjustable wooden speaker stands I engineered, in front of Rudy's classic Concert Grand loudspeakers which if you have never seen them, were each the size of an industrial refrigerator. The imaging in three dimensions from these miniatures was so astounding that all those who walked into our suite at first were convinced they were listening to the old huge loudspeaker classics, each comprised of 8 slot loaded aluminum cone tweeters, two 6 inch aluminum cone midranges and four 12 inch variable density woofers. I can't imagine confusing these with Bozak behemoths with four 12" woofers, but they ARE impressive! These may end up as front speakers in the home theater system, augmented by a sub. I emailed Peter Ledermann but never heard back from him. These Bozaks are unusual in a few ways: For one, they are very heavy for their size. For another, I can't figure out how to remove the drivers. They must be glued in place and I don't want to take any chances. Apparently there were TWO versions of the M-80--one with front-mounted fuses and one without, as pictured below. The tweeters also appear to be different. There is not a lot of info on these but somewhere I read that the fused ones were "better." Nice (I have the fused ones). 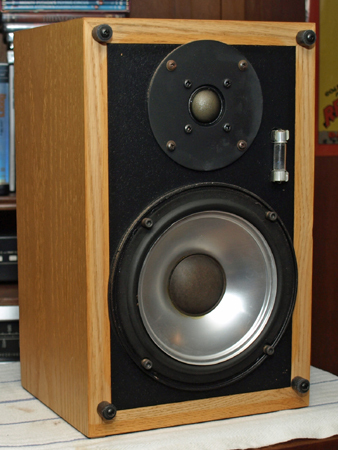 According to Wikipedia, "In 1979, Ledermann designed the Bozak MB80 bookshelf speaker and brought it to the marketplace. 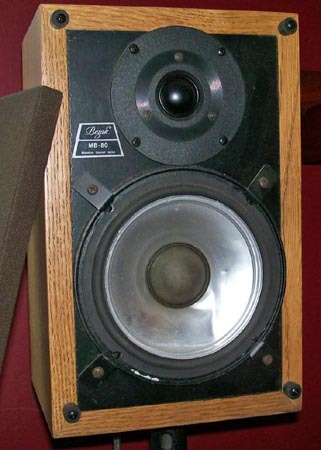 This compact loudspeaker contained a soft dome tweeter, a 6" 209-W wide range aluminum driver designed by Ledermann, and a modified first order crossover. The MB-80 employed tweeter clipping protection and indication. Rudy Bozak took note of the project, but did not participate in the design." These will probably replace my trusty AR4x's as the front speakers in my surround system. 2-1/2 years later I'm taking another crack at these. 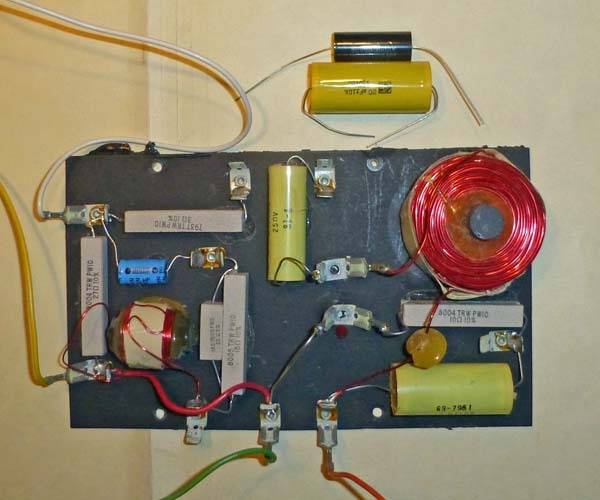 The 1st photo in Post#4 shows the actual speaker I'm working on, with the front-mounted bulb fuse. Later MB-80s had a fuse on the crossover circuit board. Very impressive build quality. Turns out the drivers were not hard to remove. The woofers are held in by 4 socket-head screws and once those are removed you have to force a putty knife under the rim of the woofer to loosen the seal. 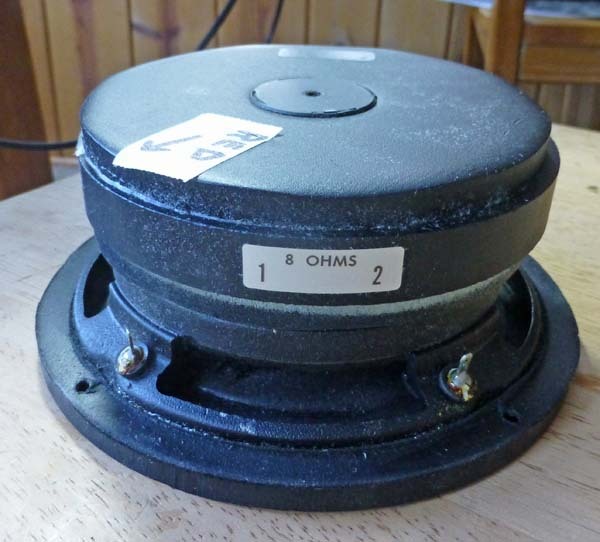 Woofer is heavy, with an aluminum cone and a huge magnet (photo below). There's some batting inside and a rather complex xo. The xo is mounted on a board (thick cardboard maybe--this is the only unimpressive part) that is held in place with 4 screws and some goo. I "thought" it would be easy to remove. I was wrong. Managed to get one out but will probably try to work on the other in place. 3. replace plastic binding posts with something "nicer"
Inductors: two inductors. Have not measured them. Above the board are a 20uF Carli and a 2uF Dayton. These were in my parts box and will replace the 22uF 'lytic. If there were more room on the board I'd use Madisound surplus caps (2x10uF + 2uF) but I had these and the Carlis are about the smallest 20uF film caps. PS: I'm adding an "after" shot of the xo here instead of in the next post, to make it easier to compare before & after. The new caps are in and the placement of the components is rearranged a bit. I re-attached the big inductor using some double-sided tape that's intended for outdoors and rated at 15 pounds so it "should" stay put. Also added some hot melt glue around the perimeter. The 22uF 'lytic was removed. I measured it and it's 25+uF so it's drifted a bit (or maybe not--that's still within spec). The new film caps are spot on. Had to move the small inductor over to make room for the film caps. The inductor is now blocking one mounting hole so I drilled another. I replaced the speaker terminals. The original plastic ones were fine but I had the new nickel-plated 5-way binding posts on hand and they will accept heavier speaker wires. That woofer is massive. This 6-1/2" (5" aluminum cone) speaker weighs in at over 7 pounds. The magnet alone, according to the sales lit, is 6 1/2 pounds! It's a Rudy Bozak-engineered six-inch aluminum cone mid range driver that Peter Lindeman converted to "an ultra wide bandwidth performer". Tweeter in these is the Polydax HD 100 D 25 A. 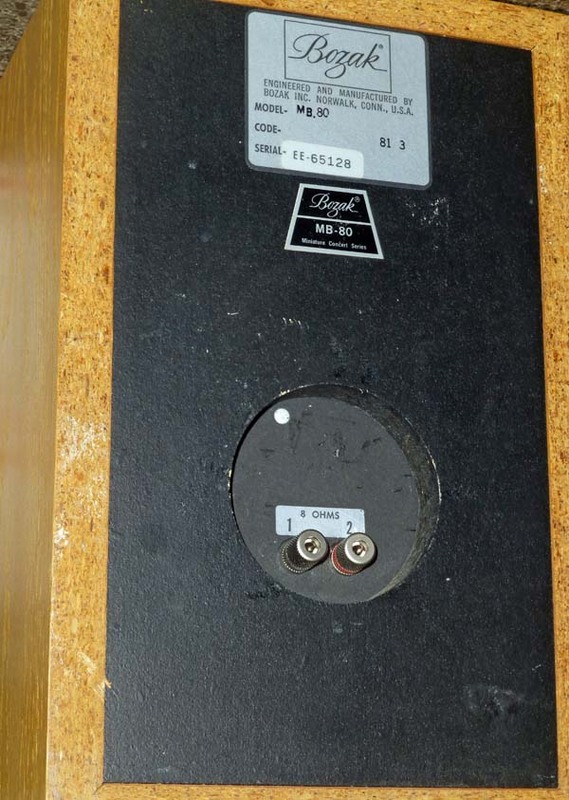 According to a Google search this is the tweeter used in the highly respected Spica TC-50 (The Polydax are no longer available but the replacement is the Audax Tw025a0). From what I've read, later versions of the MB-80 (like the 2nd photo in Post #4 above) used a ferrofluid-cooled Vifa dome tweet. So--great drivers in these! RoyC is helping with a schematic so that should be available sometime soon. PS: I moved the "after" shot of the xo to the previous post for easier comparison. To remove the xo board, first remove the 4 screws then remove the terminal posts. Use a small pry bar from the back to work it loose. There was a splintered corner on one speaker. It was repaired with JB Wood Weld. Looks OK and it will be hidden behind the grille. Also attaching a crossover schematic that RoyC drew based on a sketch and the measured values of the inductors in one of my speakers. 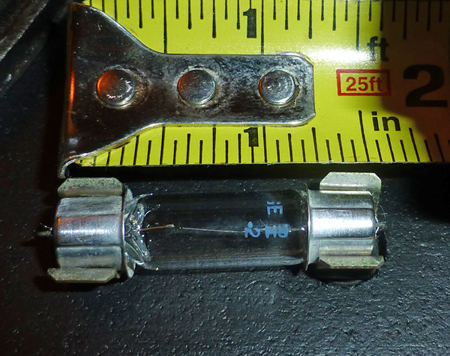 The fuses on the front baffles are incandescent lamps, about 1-1/2" long. Anyone know what these are and where to get replacements? I can't find any information on the voltage, amperage or whatever. The print on the glass is partially worn off I think. It looks like there is an "RH" and maybe "11-2". Any help appreciated.